On the left map, we grouped Triathlon Events that are located close to each other into small circles. Now, you can locate all Triathlon Events on the map at the same time. You can also drag & zoom the map. Circle numbers - Count of Triathlon Events that are located in and around that circle. Colored circles - Triathlon Events that are displayed in the list below. Grey circles - Triathlon Events that are displayed on next page(s). Half colored circles - Some Triathlon Events in that circle appear in the list below and some on next page(s). Click on circles to zoom in or highlight Triathlon Events . The Tri-County Hill Hopper is a BP MS 150 Recommended Ride with four route options available: 20, 36, 58, or 67 miles. Each route provides a hilly ride complemented by some flats. ... moreThe ride starts at 9 am and the last route sweep is at 3 pm. 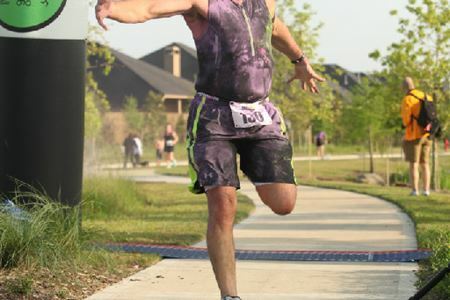 The Round Rock Raquathon Series is designed to be fun, relaxed and non-intimidating and offers an encouraging atmosphere for beginner athletes while also providing a consistent course ... morefor those seasoned athletes wishing to track improvements or get in a speed workout. The inaugural event is a Swin/Run that starts and finishes at the Clay Madsen Recreation Center. DATE, TIME, & PLACE: Saturday, March 7th, 2015 at Clay Madsen Recreation Center, 1600 Gattis School Road, Round Rock, TX 78664. The 15+ age group participants will begin at 7:30am with a 10 second staggered start. 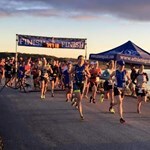 The swim portion will take place in the six lane indoor pool and the run will take place on the Greater Lake Creek Trail that begins right behind the recreation center with easy access to and from the pool. The first 350 registered participants will receive a t-shirt, water bottle and swag. Course: Snaked swim course at the Clay Madsen Recreation Center indoor pool and a looped course on the Greater Lake Creek Trail System. Awards: Finishing medals will be awarded to participants ages 7-14. Prize packages will be given to the top overall male and female finishers. The top three finishers in each age group will be recognized and times posted. For participants 15 and over, the age groups will be divided every 5 years. Parking: Limited event parking will be located on site. Additional parking is available at the Shops of Turtle Creek. Seeding: An estimated finish time for your swim distance is required for seeding purposes. Participants that register, but fail to provide an estimated finish swim time will be launched at the end of their age group. Wetsuit Strongly Recommended – Average morning water temperature during March is 50-65 degrees for this area of the lake. Hypothermia is a risk without a wetsuit. The swim course takes place in Canyon Lake starting from the boat dock at the end of transition in Canyon Park. The course is a triangle staying primarily in the bay cove area. Swim buoys mark the course. The swim is a time trial. Swimmers will start every 3-5 seconds. Swimmers are grouped by gender and age category. Multiple age categories may be paired dependig on numbers. Swimmers have the option to start more towards the front, middle or back of their group depending on their swimming ability. A team of lifeguards and kayakers will provide support on the course. Coast Guard support will keep boaters from the area. The course has two left turns before heading back to the boat ramp to exit. Wetsuits are legal in USAT events for non-Pro participants without penalty in water temperatures up to and including 78 degrees Fahrenheit. Non-pro participants may wear a wetsuit in temperatures between 79-84 degrees but are not eligible for awards. No participants shall wear a wetsuit in temperatures higher than 84 degrees. We will take and announce the water temperature on race morning. The average morning water temperature for Canyon Lake in this cove in March is 50-65 degrees Fahrenheit. The average air temperature for March is 60 degrees with an average range from 49-71 degrees. The lake depth will range from an average of 20 feet to 55 feet at a maximum. • Located at the top of the boat ramp. Steep incline. • Transition area will be divided by age groupings and gender. • Bike out is at the opposite end. • For safety reasons you must walk your bike into and out of transition. There will be clearly marked mount and dismount lines. • Listen to race officials in transition. Be courteous of other racers. • The course is one loop. 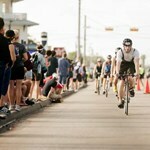 The course is a difficult, challenging, FUN course with serious climbs and descents providing gorgeous hill country views. Police officers will be present at all intersections directing traffic and helping to ensure safety. The course contains all right hand turns except when exiting and entering the park. • No drafting. You must keep at least three bike lengths between you and the cyclist in front of you. If you pass the person in front, you must do so within 15 seconds. • Stay to the right unless passing a cyclist. the draft zone from the rear before you attempt to pass. • Immediately prior to the turnoff on to Purgatory Rd. from FM 32 there is a 1.2 mile stretch with no shoulder and bumps along the right edge. This stretch will be one way but demands caution from the cyclist. cyclist’s responsibility to follow the rules of the road. • Caution: This course is technical and hilly. Be aware of traffic on 306. Officers and volunteers will be present on the course. • All participants must wear a helmet that meets or exceeds the safety standards of the Consumer Product Safety Commission. Helmets must be securely fastened before mounting your bike. You can be disqualified for not wearing your helmet. Corner of Purgatory Rd and Elkridge Rd. Canyon Lake and the park exist throughout the run course. 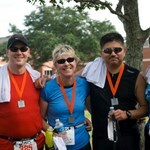 • Aid stations will have water, Gatorade and Clif products. • Run course and finish line will have aid stations. • Run course aid station will be located as you are exiting transition onto the course and midway along each loop. • Water and Gatorade will be provided at the finish line. • Fruit snacks will be available. 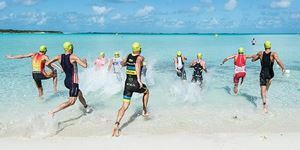 Stanley's Sprint Triathlon is a short early season event that is perfect for a beginner to test the waters or an intermediate to advanced triathlete to get warmed up for the season ... moreto come. The pool swim makes it an ideal beginner event, but the course is also a challenge for the seasoned veteran who wants to go fast and test their limits. Separate awards will be presented to the top 3 male and female in each age group. Awards will be presented to the top finishing relay team only. 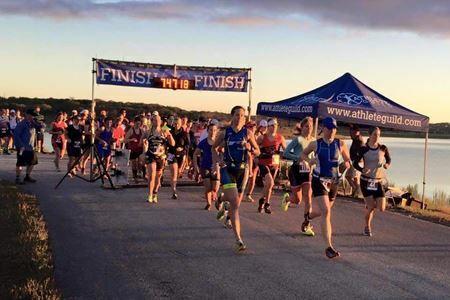 Camp Eagle is the jewel of the hill country, located outside of Rocksprings, Texas, the XTERRA Camp Eagle Off-Road Triathlon offers some of the most challenging trails of the Texas ... moreXTERRA Series with a mix of long climbs and screaming descents and technical single track. Camp Eagle offers a family friendly environment with lots of activities for your kids or significant other so bring the whole family along and plan to stay for the weekend. 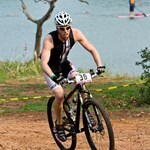 XTERRA Camp Eagle is the first of five races in the Texas Series. Bring your wetsuits! The Nueces River is spring fed by 1.2 million gallons of new water a day. The swim course begins with an out and back section and then a few surprises. Be ready for adventure on the swim unlike any other race. Following the swim, athletes ascend a steep 150' foot staircase that leads to the transition area. The bike course at Camp Eagle is one of the most scenic, yet challenging courses in the country. The bike starts by plunging downhill before taking you along the shores of the beautiful, spring-fed river. Enjoy the downhill and flat river stretch because there's some climbing ahead! The trails wind through the hill country setting accentuated by several 30-mile vistas. After flying through a dry creek-bed, the trail drops back down towards the river and your awaiting run. There is not a lot of time to think about the pain as you navigate all the obstacles (rocks), inclines (big hills), and water (that river again). This challenging course will leave you wanting more! Points are awarded to the top 15 in each group and by gender. Age groups are 15-19, 20-24, 25-29, 30-34, 35-39, 40-44, 45-49, 50-54, 55-59, 60-64, 65-69, 70-74 (m), 75+ (m). 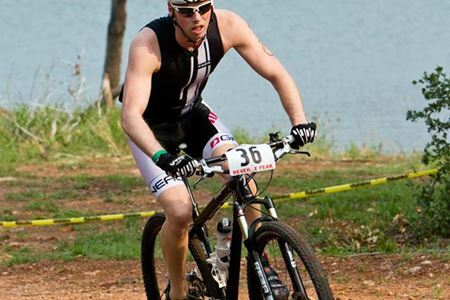 The XTERRA Physically Challenged age groups are 15-39 and 40+. Participants under age 15 do not receive points. Join us for the 2nd Annual Tri Color Super Sprint Triathlon. This fun event has a special little addition on the run guaranteed to add color to your morning and you are able to by ... morepass the color. We welcome any all ages safety able to do this distance. This is a chip timed event. Occasionally a split is missed due to a misread or improper chip placement. We apologize now if this happens. Every athlete will receive a finisher's medal, t-shirt (you are guaranteed a shirt if registerest before we order them) and other items. This year we’re back at Kemah with parking at the boardwalk, transition near the water, and a run course winding through the Kemah Boardwalk. 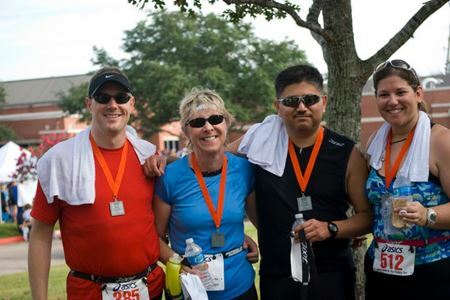 We hope you’ll join us in celebrating ... morethe 6th Annual Kemah Triathlon on April 12, 2015. In the coming months we will update the overview with one comprehensive course map for each race (adult tris, kids tri, 5k). Until then please explore the links below and checkout each of the courses and what they have to offer. This race is not for the faint of heart. Although very beginner friendly please keep in mind that If open water and/or salt water is not your thing then think twice before signing up. Keep in mind that swimming in the ocean can be smooth as glass or very choppy, it varies from year to year. A wetsuit will help with this. Wetsuits are used for warmth but another great benefit they offer is flotation. Most suits will keep a swimmer floating with little to no effort greatly increasing efficency and offering a much welcomed peace of mind. If you’re up for the challenge the olympic time trial boat start is a ton of fun and something you’ll remember the rest of your life. Typically the sprint swim is a bit harder than the olympic because of the directional changes (buoy turns), sun, and wave start factors. Either way both courses offer unique and rewarding challenges. Althought the bike course is flat there can be a lot of wind at times presenting a challenge typically on the way out but rewarding you greatly on the way in. The run is simple yet enjoyable as runners get to take in the sites and sounds of both the City of Kemah and the attractions at the Kemah Boardwalk. Kemah is truly one of the most unique venues in the United States and we are beyond exited that they’ve allowed us to move the race back to where it all began in the heart of the City of Kemah and the Kemah Boardwalk. Also, remember that this event is an Escape to Alcatraz Qualifier and part of the Escape To Series! Top age group winners in the olympic distance race will receive a qualification spot to one of the most sought after races in the world. Take the guesswork out of triathlon training and racing! We ’ll be working with you this evening to help you design your own triathlon training calendar. We will also talk about choosing ... morethe proper equipment, fueling tips, transition tips and suggestions, swimming and open-water tips, & how and when to taper and why it is so important! 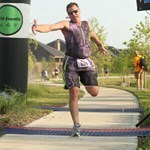 Plus, on Saturday, June 6th Bayou City Outdoors will be holding a “Try it on Tri” for beginners. This event will be for all triathletes who want to practice their swim/bike/run and transitions. 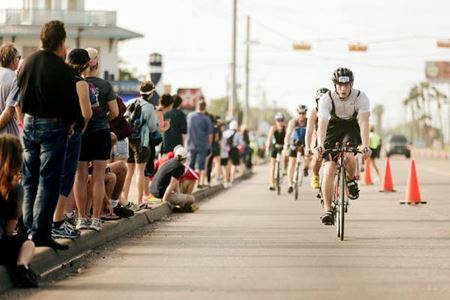 Set up to be a fun-only event, it will model a triathlon from start to finish! 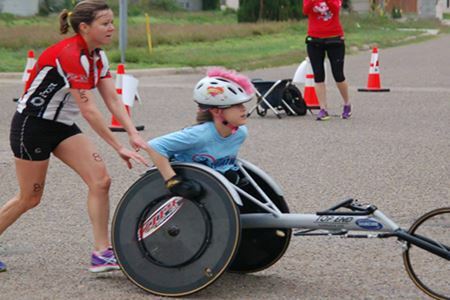 Save yourself from trial-and-error experiences that discourage many from giving Tri’s a try! Be a smart triathlete from the get-go. Your speakers this evening will be a panel of BCO triathletes. TRIATHLON COURSE INFORMATION Swim: 600 yard open water lake swim. This is a small lake, so no need to worry about rough water. Bike: 13 miles on a circular course, mostly along farm ... moreto market roads with rolling hills. Run: 3.1 miles on a closed, dirt road, mostly flat. The run will be 3 laps around the lake. This is a USAT sanctioned event, all rules apply and will be enforced. The bicycle drafting penalty will be two minutes for each infraction. Anyone riding a bicycle without a helmet will be disqualified. The awards ceremony will begin about 11:45 am. Overall winners will receive a plaque and other special awards. Triathlons calendar for finding triathlons events. 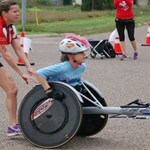 Search weekly triathlons events of different skill levels from novice beginner friendly triathlons to advanced. Triathlons range from beginner’s sprint or mini triathlon to advanced level triathlon competition and ironman triathlon. Extensive search options give you access to team triathlon events, junior triathlon, sprint triathlon races and olympic triathlons.